The middle-aged man in question has been dubbed the “Grim Eater.” At funerals in Wellington, New Zealand, he’d show up, dressed somberly. He’d pay his respects to the departed, stay out of the way, and then stuff himself on free food at the funeral home, despite obviously not knowing the recently deceased or any of the other family members. Not only is it pretty classless, it also got the man banned from Harbour City Funeral Home and its fellow chain outlets. So just how brazen was this sneaky snacker? Not only was he crashing up to four funerals a week throughout March and April, he also came prepared to make his stealing easier. “Certainly he had a backpack with some Tupperware containers so when people weren’t looking, he was stocking up,” says Harbour City director Danny Langstraat. That’s when the chain stepped in, distributing his picture to other locations and taking the man aside to tell him he could attend, but not take food home with him afterward. While it’s classless, it’s not theft. 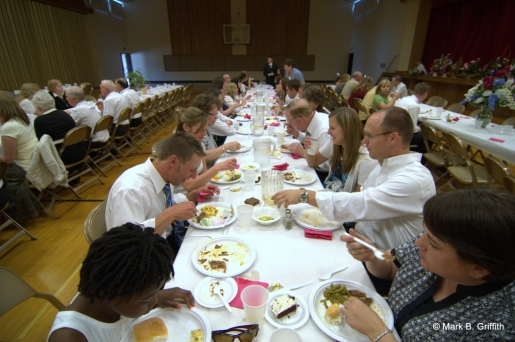 Funerals are public events, and the food is usually there for the taking. Still, funeral-crashing is a major party foul, unless you’re the guest of honor.